Millions of years of geological evolution has left the African continent with some of the most spectacular natural wonders on the planet. Tectonic and glacial movements have shaped the African surface to some breathtaking natural shapes and dramatic landscapes. Southern Africa has received its share from Mother Nature resulting in a wide diversity of scenery; rugged coastlines, lush and tropical vegetation, vast deserts, dramatic mountain ranges, natural oases, pristine nature and dazzling white sandy islands. 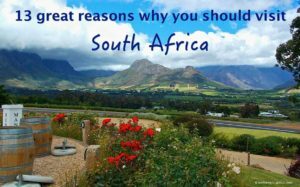 To select some of the most beautiful natural wonders of South Africa is not easy and it is tempting to include too many natural wonders in the list. I’ve been travelling in Southern Africa for the last 8 years and have been able to visit beautiful places very frequently. I’ve selected a list of 7 natural wonders that were always very appealing to me during my repeated visits to the various countries. 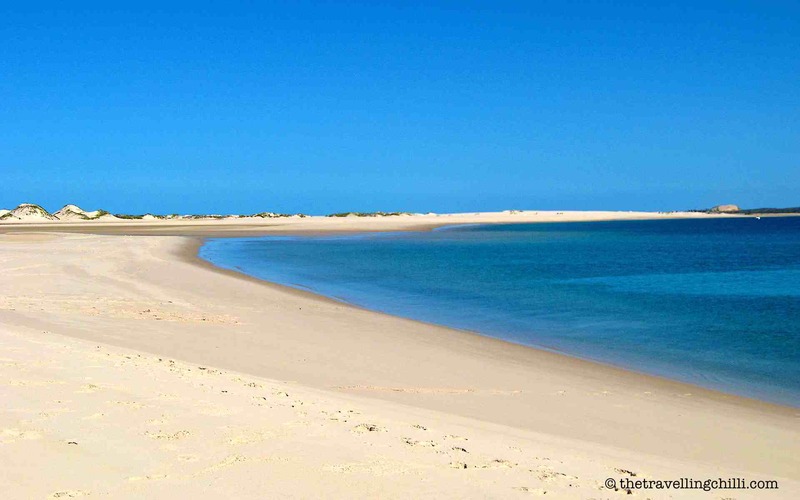 The Bazaruto Archipelago is a group of 5 tropical islands; Bazaruto, Benguerra, Magaruque, Santa Carolina and Bangue, located off the coast of Mozambique. It is well renowned for its white sandy beaches and warm crystal clear water of the Indian Ocean. 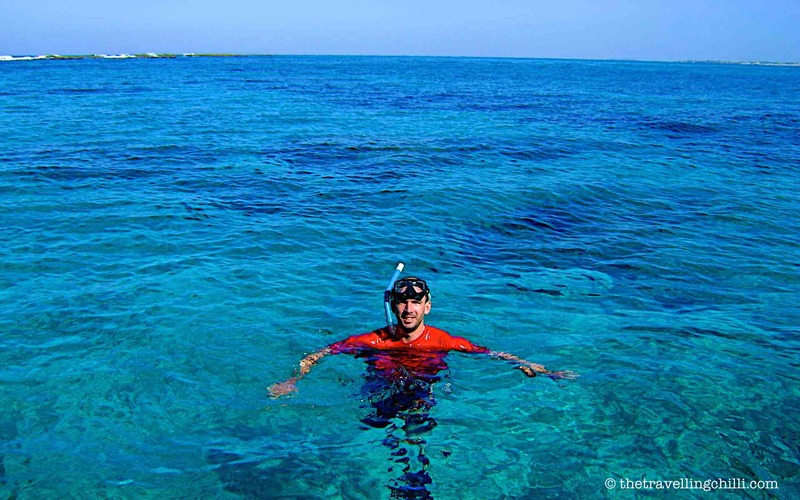 Today the Bazaruto Archipelago is a national marine park, protecting and conserving the many bird and fish species, like the dugong and sea turtles. The beautiful coral reefs and the abundance of colourful fish species makes it a perfect diving destination. Not many tourists have discovered the archipelago yet and when visiting you’ll be amazed by its serene quietness. The islands themselves consist of miles of deserted white sandy beaches with the interior a patchwork of trees, bushes and wetlands. The only overnight possibilities on the islands are some luxury accommodations which are dotted across the various islands. I’ve had the possibility to visit the Bazaruto Archipelago a few times and enjoyed the splendid beauty of the beaches, warm water of the Indian ocean and snorkelling around the coral reefs. It is so peaceful, beautiful and just gorgeous. 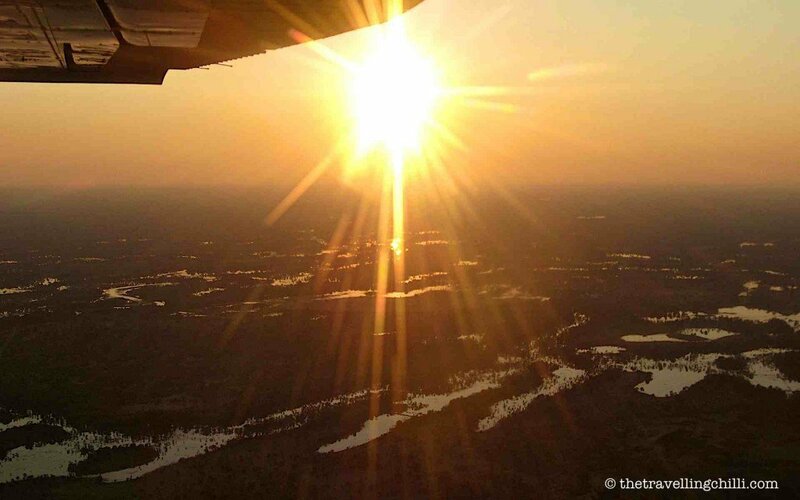 With a great diversity of wildlife, a maze of narrow canals intercepting thousands of small islands and rich vegetation, the Okavango Delta is definitely a natural wonder of Southern Africa. Located in Botswana it is one of the worlds largest inland delta systems, having its own ecosystem within the arid Kalahari desert. 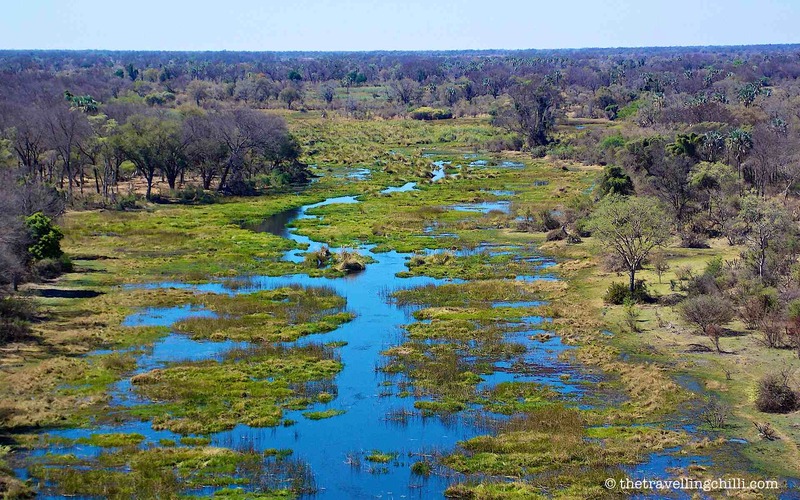 The abundance of wildlife as well as its pristine beauty, makes the Okavango Delta an attractive destination for visitors in Botswana. While sleeping over in the campsites or the various luxury accommodations, one can hear lions roar in the distance, hippos grazing next to your tent at night, see elephants drinking from the water in the canals and just be one with the serenity of nature. The Victoria Falls originate from the Zambezi river, which is the fourth largest river in Africa and marks the border between Zimbabwe and Zambia. With a width of 1708 metres (5604 ft) and a height of up to 108 metres (354 ft) the Victoria Falls is classified as the worlds largest waterfall. In 1855, the famous Scottish explorer David Livingstone who was the first European to lay eyes on the falls, was so fascinated by the beauty of it that he named the waterfall after Queen Victoria. The local people know the falls as Mosi Oa Tunya, meaning the smoke that thunders. The falls can be admired from both countries. The largest part is in Zimbabwe (1,2 km), were you can see the falls from the front. Just beware during high water, you’ll get wet from the spray. From the Zambian side the view into the gorge is better and at certain months of the year, you can take a dip into the Devil’s pool. 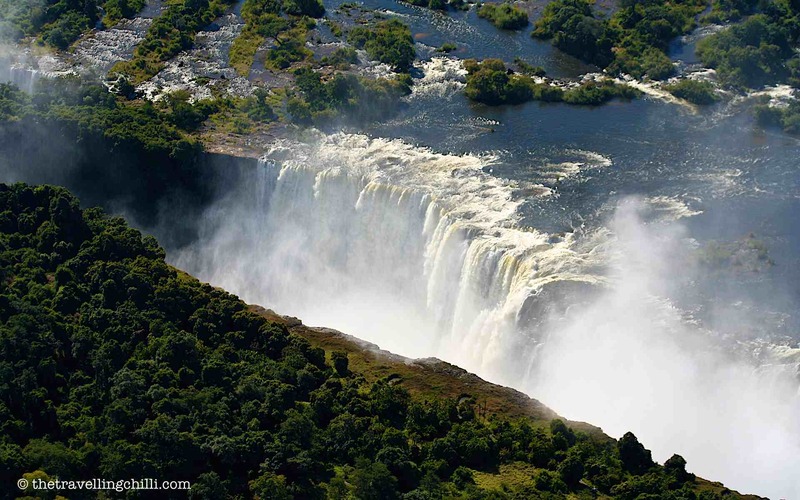 The falls and the gorge provide some great adrenaline activities in both Zambia and Zimbabwe. Sossusvlei in Namibia is another one of the jaw-dropping natural wonders, being fascinating and surrealistic at the same time. 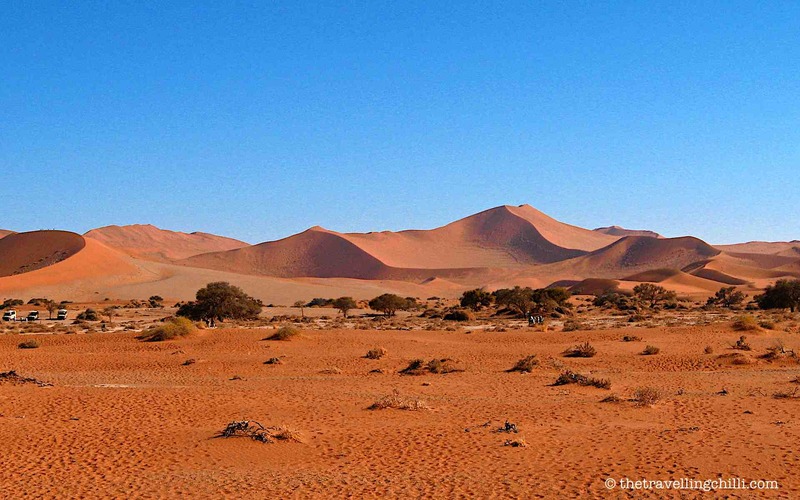 It is part of a larger area in the Namib desert characterised by some of the highest sand dunes in the world. The bright red-orange colour originates from the amount of iron in the sand. It is particularly spectacular to see during sunset and sunrise when the glow of the sun changes the deep red hue of the dunes. 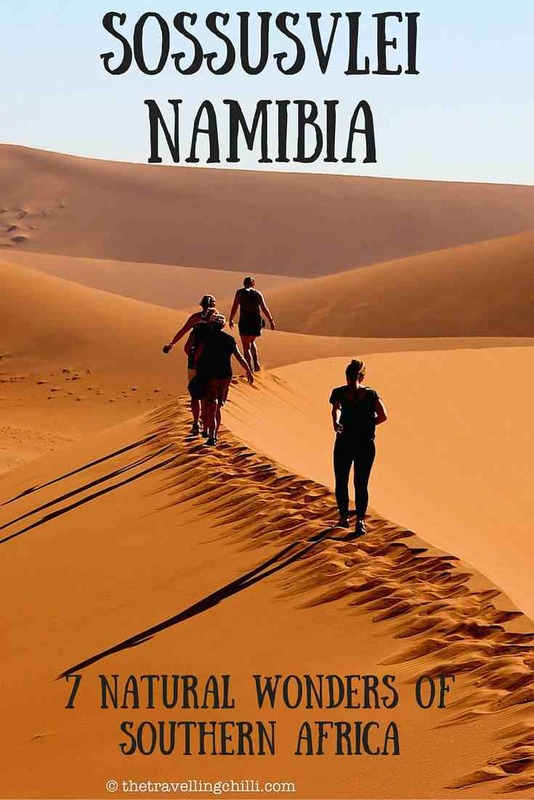 From the entrance of the national park to the location of Sossusvlei and Deadvlei the dunes are stretching out over a distance of about 70 kilometres. Springbok, gemsbok, ostriches and other smaller wildlife can be seen during the day roaming between the dunes. Sossusvlei refers to a marsh where water flows into from the nearby mountains when it rains. In this marsh, acacia trees and various bushes can grow in the dry desert area. The acacia trees have roots that grow down to 80 meters deep in order to gain more water and survive the harsh desert conditions. Sossusvlei is marked by the surrounding red dunes. Deadvlei on the other hand is a marsh that used to receive water during the rains. 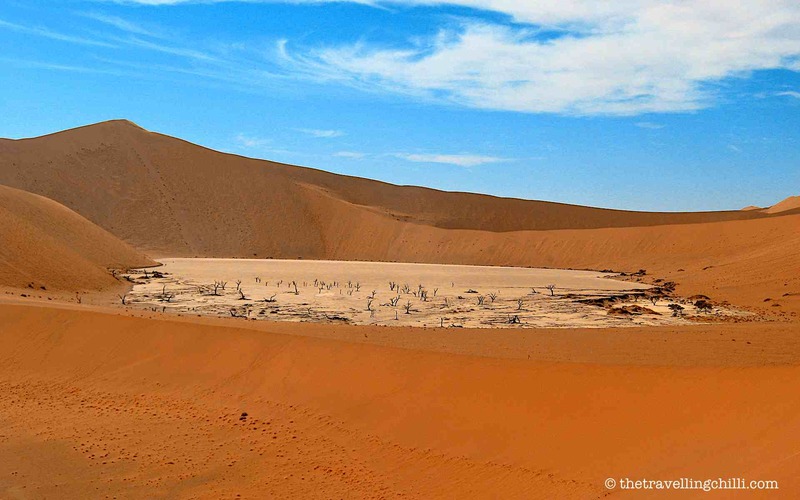 Due to the growth of the surrounding dunes however the flow of water was closed off to the pan, resulting in Deadvlei drying out. Currently Deadvlei is marked by a white clay pan, surrounded by some of the highest red dunes and dried out Acacia trees. The trees could not survive without the water and started drying out, but due to the extreme dryness of the region they do no decompose and are now decorating the pan with their wicked shapes and forms. 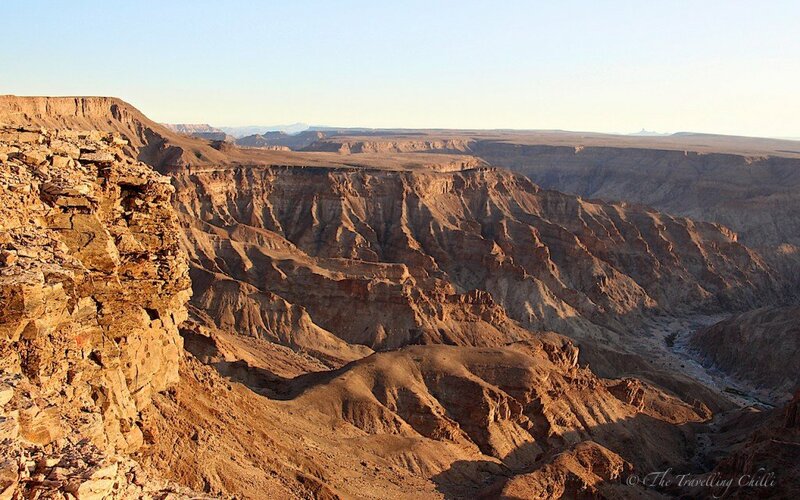 The Fish River Canyon is the largest canyon in Africa and the second largest in the world. It is much lesser known than it’s bigger brother, the Grand Canyon, but nevertheless a beautiful world wonder. Various geological and glacial movements have shaped the canyon to what it is today. Various viewpoints provide the visitor a good way to observe the true grandeur of the canyon. 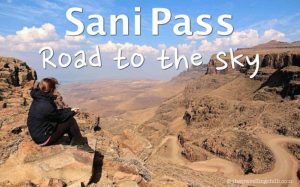 For the adventurous ones, during the cooler winter months, a multi day hike can be taken stretching over 80 km following the fish river to the end of the canyon. The Fish River Canyon is definitely a natural wonder in Southern Africa and a hidden gem in the south of Namibia. 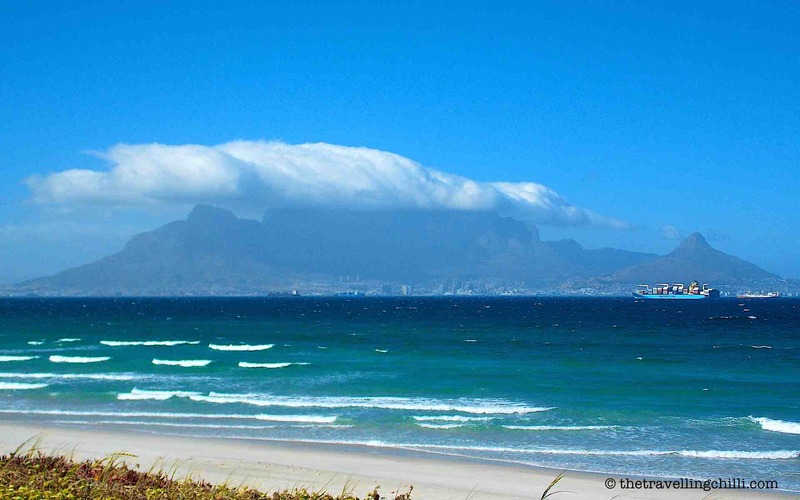 One of the most notable icons of South Africa is without doubt Table Mountain. The flat topped mountain is towering over the city of Cape Town which is almost fully built on the foot of the mountain. Table Mountain is definitely one of the most beautiful natural wonders of South Africa. Table Mountain is one of the most visited tourist attractions of South Africa. A nice walking trail takes you to the top of the mountain (when not using the cable car) 1086 meters at its highest point, providing you the most awe-inspiring view of Cape Town and surrounds. Table Mountain is officially recognised as one of the new 7 wonders of nature in the world. Located on the eastern part of South Africa, the Blyde river canyon is apart from being one of the largest canyons in the world, also known as the “green canyon”. Lush vegetation covers the dramatic sandstone cliffs and it forms part of the Northern Drakensberg escarpment. 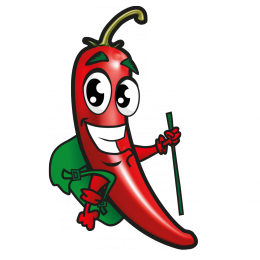 Since the canyon is located on the way to the Kruger National Park, it attracts many tourists and local visitors. The canyon can be admired from various viewpoints, such as the three roundavels and bourcke’s luck potholes. It is also a popular hiking destination and during the wet seasons various waterfalls can be visited, such as the Berlin and the MacMac falls. 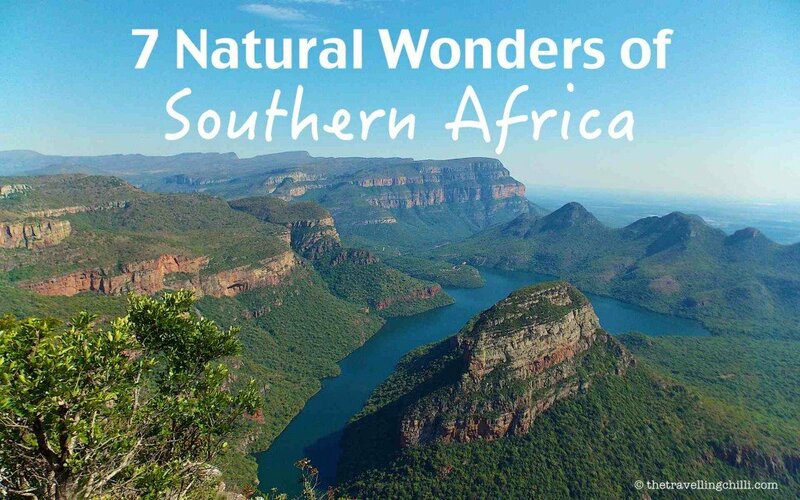 It was not easy to select only 7 natural wonders in Southern Africa. There are so many natural landmarks in this part of the planet. 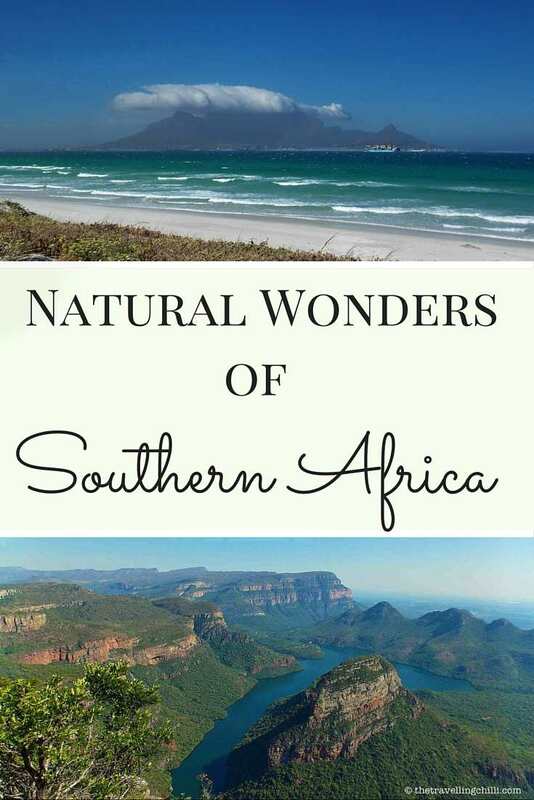 On the whole, Southern Africa is a beautiful region with some gorgeous places to visit. What is the most beautiful natural wonder you have ever visited? These are gorgeous! That canyon looks so surreal! Looks like a beautiful place to visit! These places look so great! And all so different! I’m adding them to my bucketlist right now! Beautiful pictures. Mozambique is such a stunning country – definitely my favourite in this part of the world. Incredible diving there too! All these places look so gorgeous! Will definitely need to visit!! I’ve only been to South Africa but would love to visit more countries in Africa. The Victoria Falls are high on my list, they look amazing! Spectacular photos! Thanks for sharing and giving me a few places to start my research on travelling in southern Africa! Amazing! You’ve been to all these spots!! Nature is stunning..
Well if I didn’t already want to travel to Africa I definitely do now! Amazing pictures. I stopped at South Africa for transit a few years ago when I was on my way to Argentina. Looks like I missed a lot! I have never been to Southern Africa. Your post makes me want to put this part of the world higher up in my bucket list. oh wow! that victoria falls, is that ever grand?! it’s also my dream to see a desert! I visited South Africa in 2013 and loved every minute. We went all over the country. Table Mountain and Blyde River Canyon are definitely places everyone should see in person. I didn’t make it to Namibia or Mozambique that trip, but it’s on the list for next time! Namibia is really worth coming back to Southern Africa, such a nice country, especially since you also loved South Africa. 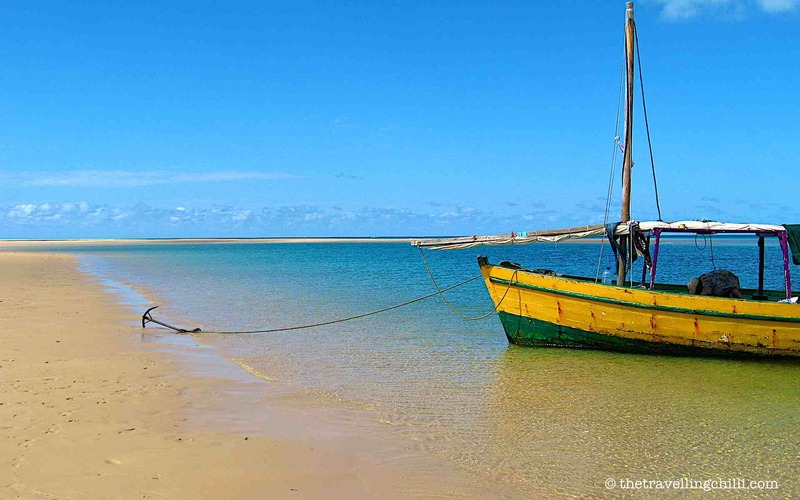 Mozambique is wonderful too, with lovely beaches and a completely different culture. 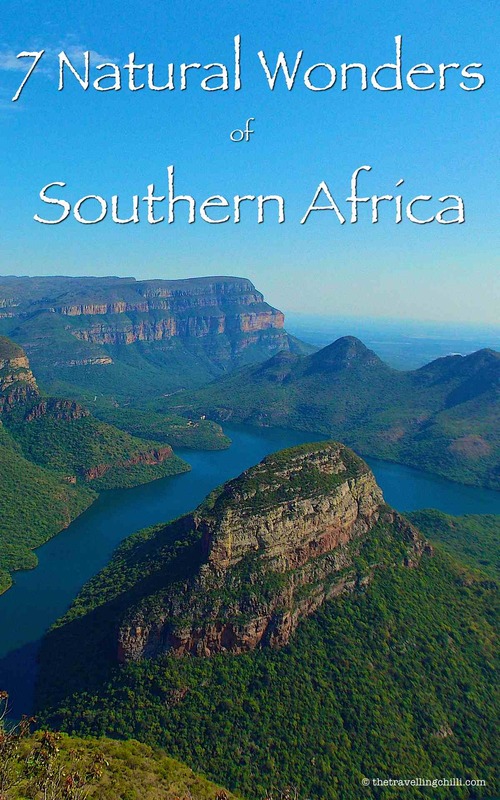 South Africa is top of my travel wish list for 2016! Beautiful photos! I will be on a 15days through 6 countries road trip this December. 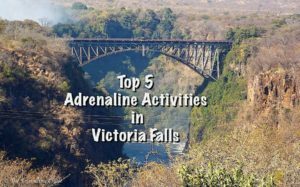 I can’t want to see the majestic Victoria falls and take a leap off the bridge in a bungee! ???? Oh boy! These pictures are great. I’ve been wanting to go to Mozambique for a while now. Was very closeby, in Seychelles, earlier this year, but ran out of money! HA. Everything looks drop-dead gorgeous, but I would love to visit these three (in this order) – Victoria Falls (and its devilish basin near the drop), Tabletop mountain, and Blyde River Canyon. The Canyon looks so enormous, but so friendly and green! Most beautiful natural wonder? I have to say Victoria Falls. I haven’t seen it in 20 years but for me it’s what sticks out most in my mind. But the views from Table Mountain also so spectacular. It’s difficult to choose a favourite one. The Victoria Falls are amazing and probably haven’t changed in 20 years, the towns around it have. Mozambique and Zambia are great, you’ll love it!! WOW! I lived in West Africa for six months and the sights weren’t at all like this. There is so much more diversity too, it seems. 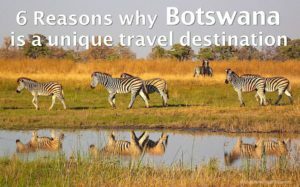 Botswana and Mozambique have been on my short-list for years! I added you on Instagram! Very excited to see more from you guys! Thanks, great that you liked it 🙂 Where did you live in West Africa? Sean has been working there as well for a few years, in various countries!! I can’t wait to get to Africa and explore. I feel like Africa is one of the most diverse continents with so many amazing cultures and landscapes to experience. I have been Egypt and can’t wait to see more! Love your pictures! Great wonders, I’ve been to most of these – Mozambique is high on the wish list now! Have to say, Namibia and the Okavango are true wilderness places, I just live the isolation and enchanting landscapes – in many ways one of the most romantic thing I know that you can do, is to be completely alone in one of these places! I love all of these, but Blyde River Canyon in South Africa is my favourite. It’s so beautiful (but so are the other places! hehe). Beautiful photos guys 🙂 The only one of these I’ve been to is Victoria Falls, and the high octane thrill of sitting in Devil’s pool is one of my all time favourite travel highlights. Some of these I’m familiar with, some not…and thanks for opening up these new experiences to me. The canyons of Namibia and South Africa look especially tantalising to me! Now this is my type of adventure!! I love this so much!! I’m a nature junkie, so I loved this post. I need to get to South Africa. My favorite in recent history was the Wadi Rum desert. I’ve been to Wadi Rum a few years ago and that was so nice. And if you like Wadi Rum, you are going to love Southern Africa, some areas are pretty similar, especially in Namibia. Thanks for this glimpse into South Africa’s nature. It’s definitely inspirational. Beautiful photos, Victoria Falls looks amazing. This looks great! I can’t wait to go to Victoria Falls. Gorgeous photos! Mozambique is my favourite of these 7. I keep reading about it and seeing photos of those amazing beaches. So empty too! Need to add them to my bucket list. The natural wonders that have impressed me recently are the beaches on Con Dao in Vietnam… beautiful white sand beaches and we had the beaches to ourselves a lot of the time. Table Mountain is nice to see and to climb. When will you be going to South Africa? You’ll love it! Been to all but Bazaruto (I’m dying to go). Very glad that two of Namibia’s natural wonders made the list! Bazaruto is absolute paradise, so nice and quiet. You’ll love Mozambique in general! You at least made 6 out of 7. 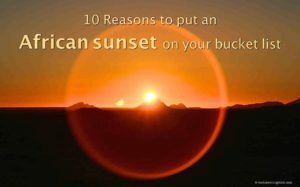 And Southern Africa has so much more to offer. My favorite natural wonder is Iguazu Falls, although hard to decide if the Argentinean or Brazilian side is better! I’ve always wanted to go to Victoria Falls, did you visit all these places on one trip?? Great to see Okavango Delta and Victoria Falls on here, as I have visited those and totally agree that they deserve inclusion. I would really love to check out the Bazaruto Archipelago. Looks stunning! You may have already noticed by Googling, but the cost of flights to South Africa in particular are significantly less than anywhere else in Southern Africa as it is still a very frequently flown and therefore very competitive flight route. So go ahead, and book that flight! 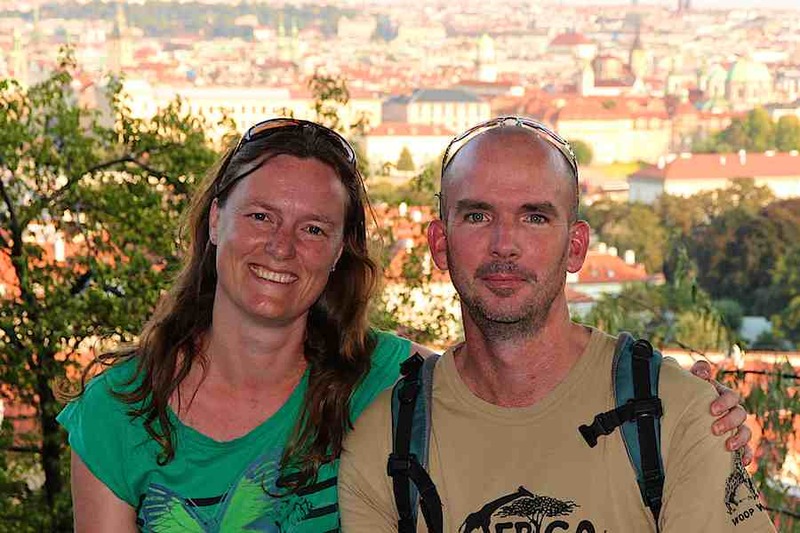 Once in Johannesburg, you can rent anything with wheels, such as a 2 person 4×4 camper and get on the road from there. Cross border rentals are possible. Great compilation. I live in South Africa and have seen some of these, but I still haven’t been to Namibia and the Okavango Delta. oh wow!! Thank you so much i have liked each single one then. I have also got a wonder to share over with you guys which is the Murchison falls in Uganda believed to be the World’s most powerful waterfall.